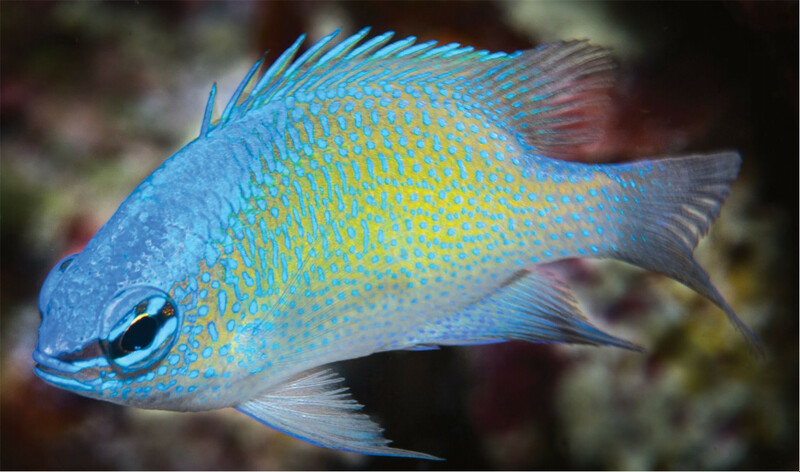 In recent years, the Blue-spot Damselfish (Chrysiptera oxycephala) has blossomed from a single widespread species into a diverse complex of geographically isolated taxa, each recognized as a distinct species. And now there’s yet another new name to pile atop this confounding heap of pomacentrids, found only in a tiny sliver of Indonesia renowned for its unique assemblage of reef fishes. 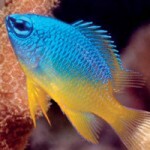 To refresh your memory, Chrysiptera oxycephala is a drably colored damselfish with a pretty blue and yellow juvenile. It was described by the inimitable Pieter Bleeker from Timor, Indonesia in 1877, and, for the next century or so, that was the name given to similar populations found all across the Coral Triangle. But this would all change once pomacentrid guru Gerry Allen got his hands on the group. He first described a blue population from the Bismarck Archipelago off New Guinea as C. sinclairi. That was in 1987. Thing remained quiet for a while, but, with the help of some convincing genetic data, a trio of new taxa (C. ellenae, C. maurineae, C. papuensis) appeared in 2015, each found in a small portion of New Guinea. Fast forward to 2017 and we have another addition from the Solomon Islands, C. burtjonesi… but there was still more work to do with these fishes. 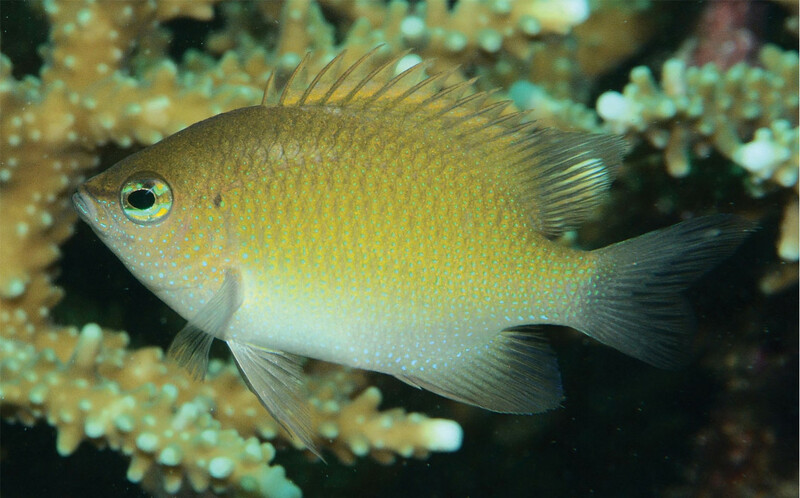 Appearing in the latest edition of JOSF, Uswanas’ Damselfish (C. uswanasi) is described from around the Fakfak Peninsula of West Papua, which lies to the southeast of the famed Raja Ampat Islands and Birdshead Peninsula. Similar to those biodiversity hotspots, Fakfak and neighboring Triton Bay are home to a number of reef fishes found nowhere else. 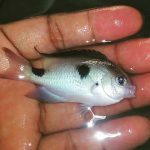 Some of the more familiar examples are the Nursalim Flasherwrasse (Paracheilinus nursalim), the lovely Giti Damselfish (Chrysiptera giti), the damselfish-mimicking Jamal’s Dottyback (Manonichthys jamali), the Triton Epaulette Shark (Hemiscyllium henryi), and, most recently, the highly endemic Bluemouth Damselfish (Pomacentrus bellipictus). The reason for all this excessive speciation relates to the local geography. The reefs of the Fakfak Peninsula are surrounded by several muddy bays (Bintuni, Arguni, Triton, Etna) inhospitable to reef growth, which naturally isolates the populations here. 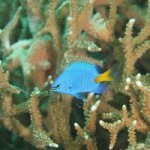 The closest neighbor to C. uswanasi would be Ellen’s Damselfish (C. ellenae), reported only from the Raja Ampat Islands. That species is, however, easily told apart, as the juveniles are solidly blue (vs. blue and yellow) and the adults are noticeably green in hue (vs. yellow). The drably colored ventral fins of adult C. uswanasi are another useful trait when comparing with others in this complex. So how many more of these damselfishes are there lurking in the Coral Triangle? To date, the populations from elsewhere in Indonesia and the Philippines remain inadequately studied. 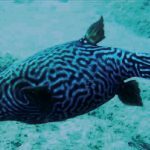 It’s all but certain that those from the Philippines and northwards represent a distinct species, as that’s a pattern of speciation seen widely in a variety of reef fish groups. It’s also plausible that places like Halmahera, Tomini Bay, and the Makassar Strait might each have their own variation of C. oxycephala, but this awaits further genetic study. 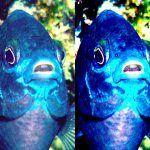 While these damselfishes might strike many as being a bit dull, they are anything but when it comes to their complex evolutionary origins.